Will new rules attract new fans? 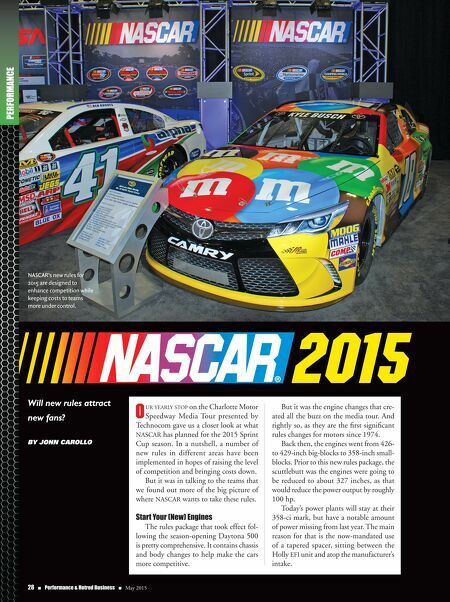 By John Carollo 28 n Performance & Hotrod Business n May 2015 PERFORMANCE 2015 NASCAR's new rules for 2015 are designed to enhance competition while keeping costs to teams more under control. O ur yearly stop on the Charlotte Motor Speedway Media Tour presented by Technocom gave us a closer look at what NASCAR has planned for the 2015 Sprint Cup season. In a nutshell, a number of new rules in different areas have been implemented in hopes of raising the level of competition and bringing costs down. 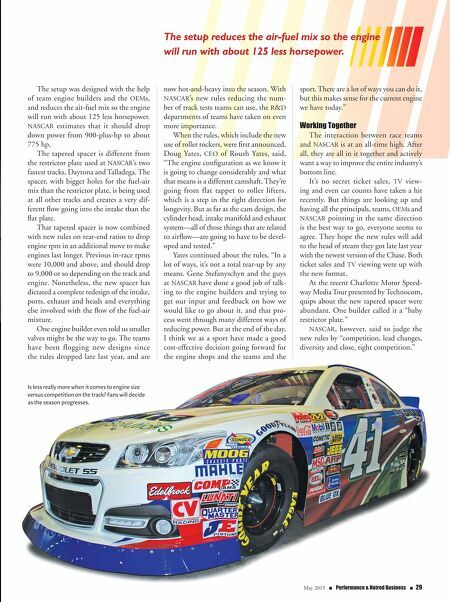 But it was in talking to the teams that we found out more of the big picture of where NASCAR wants to take these rules. Start Your (New) Engines The rules package that took effect fol- lowing the season-opening Daytona 500 is pretty comprehensive. It contains chassis and body changes to help make the cars more competitive. But it was the engine changes that cre- ated all the buzz on the media tour. And rightly so, as they are the first significant rules changes for motors since 1974. Back then, the engines went from 426- to 429-inch big-blocks to 358-inch small- blocks. Prior to this new rules package, the scuttlebutt was the engines were going to be reduced to about 327 inches, as that would reduce the power output by roughly 100 hp. Today's power plants will stay at their 358-ci mark, but have a notable amount of power missing from last year. The main reason for that is the now-mandated use of a tapered spacer, sitting between the Holly EFI unit and atop the manufacturer's intake.